You may find this page helpful if you're visiting Koh Phi Phi for the first time. We know the feeling most of us have when travelling to the other side of the planet to arrive at a destination we've never been before. The tiredness involved with long trips can alter our perception of things, and it can leave us somehow puzzled the first day of our holiday in a new environment. This is why we wrote this Phi Phi Island survival guide. You'll find here the restaurants, attractions, nightlife entertainment and even hotels we love on Koh Phi Phi. What's Good About Koh Phi Phi? The ferry trip, at least for a first timer is a delightful experience. Take a trip around to Bamboo Island and Mosquito Island and stop off at Laem Tong Beach for lunch, this part of the island is nothing like Tonsai. The entire Island is lovely, breath-taking and worth allowing a few days. You can head to Phi Phi Viewpoint. It takes about 20 minutes to climb up there, and the view is worth the effort. On the way down, you can make a stroll along the inland path that leads to the eastern part of Tonsai Bay and has lunch there before to get back to your hotel, then catch the last ferry that leaves Phi Phi at 14:30 to Phuket, or 15:30 to Krabi. Phi Phi hotels and resorts permit their guests to discover the area's natural beauty and enjoy a wide selection of leisure activities on the islands: sunbathing at Maya Bay (The Beach), snorkelling at Bamboo Island, scuba diving at Koh Bida, feeding macaques at Monkey Beach, and spotting gentle sharks at Shark Point are just a few of the possibilities offered to Phi Phi vacationers. Best Places to Go at Night in Phi Phi Phi Phi has an excellent reputation in a matter of late-night partying. Most of the action after dark is concentrated on Tonsai Village and its immediate surroundings (Loh Dalum and Tonsai East). If you come for the first time to Phi Phi, the following nightspots are not to be missed. A legend in its lunchtime, the Reggae Bar chugs along year after year with differing approaches to draw punters in. And when they come, this place is heaving with energy, loud music, Muay Thai kickboxing matches. Discover Tonsai Bay nightlife. It's legendary, it's noisy, and it's a lot of fun, Phi Phi nightlife has acquired a worldwide image of being hedonistic, bucket-fuelled and late. All of the above applies so be prepared for some pretty late nights and mornings and for waking up, wondering why there's sand in your hair and just how you found your way back to your room/bungalow last night. The pub offers various prizes to entice people into the central ring and has a go and people are by and large willing to do so. There are also organized matches between locals and several fights are quite high stakes between known professionals brought in for the occasion. 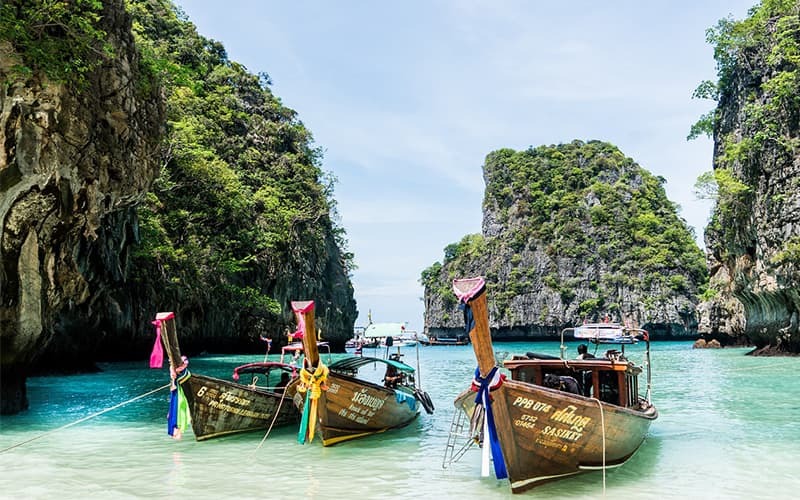 As a popular cosmopolitan destination, Phi Phi hosts a lively dining scene. Whether you're looking for cheap, mid-range or upscale Thai and occidental fares, you'll find them here. We've picked out three absolute must-try restaurants for your first time in Phi Phi. The first of them is an unpretentious gastro-bistro located next to the pier. The second one is a chic Bohemian-style restaurant settled in a small lane of Tonsai Village. The third one is a stylish beachfront restaurant located toward the western end of Tonsai Bay. Getting to Phi Phi Island is pretty straightforward. This group of six islands is located 46km from Phuket and roughly the same distance from Krabi. To get to Phi Phi, there are two options: ferries and speedboats. The ferry is by far the most popular method of reaching the islands. Ferries take about two hours from Phuket and 90 minutes from Krabi or Koh Lanta. The main departure/arrival port in Phuket is Rassada Pier, located in Phuket Town. In Krabi, the central ferry pier is Klong Jirad Pier, situated just south of Krabi Town. The ferry terminal is a one-hour drive from Phuket Airport, and Krabi's is 30 minutes from Krabi Airport. To get good seats, you should arrive well in advance in high season or half an hour before departure in low season. If you are travelling from Bangkok, you need to get to one of these two piers to catch a ferry to Phi Phi. Once you arrive at the airport or the Boko (inter-city bus station), you'll have to take a taxi or a local bus to get to the ferry terminal. Please have a look at the Phuket and Krabi ferry schedules beforehand so that you can plan your trip accordingly.